Shawnee’s Damien Zeigler, left, defends against Kenton’s Jacob Zepeda during Thursday night’s Division II district final at Elida. See more soccer photos at LimaScores.com. Shawnee’s Jacob Miller (12) gets away a shot against Kenton’s Kobe Kirk during Thursday night’s Division II district final at Elida. Kenton’s Cobe Heydinger pressures Shawnee’s Cameron Tenwalde during Thursday night’s Division II district final at Elida. ELIDA – Kenton midfielder Reed Cook had only taken one penalty kick in his high school career. But after Thursday night, he’s now 2 for 2. Cook connected on a walk-off, penalty kick in the second round of penalty kicks to lift Kenton to a 3-2 penalty-kick shootout victory over Shawnee in the Division II boys soccer district finals at the Elida Sports Complex. The match was tied at 2 at the end of regulation and two 15-minute overtime periods. Both teams made four penalty kicks out of their five shooters in the first round of penalty kicks. In the second round of penalty kicks, Kenton won the round 2-1 after Cook’s liner into the lower-left corner of the net finally ended the match. 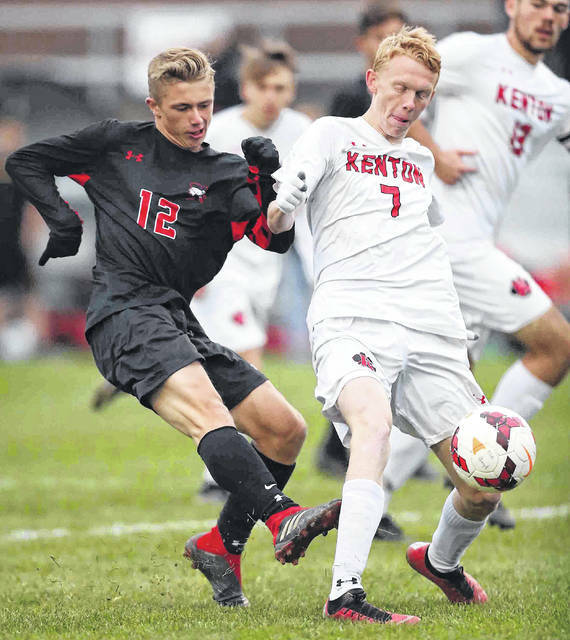 Kenton (17-0-1) advances to the regional semifinals against Toledo Central Catholic at 8 p.m. Wednesday at Findlay High School. Shawnee ends its season 14-3-2. 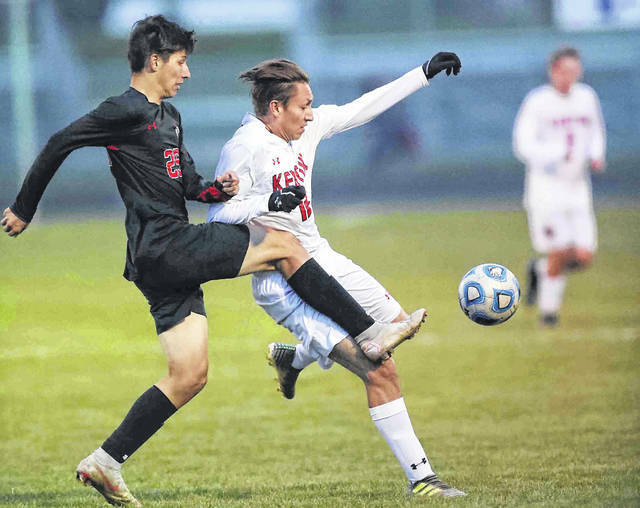 It marks Kenton’s first trip to the boys soccer regionals. “It was a game between two fantastic teams and it was a shame that one of our seasons had to end,” Kenton coach Jamie Bartlett said. “And Reed Cook stepped up there with some big-time nerves and put a shot in the back of the net that we needed, but we had the absolute faith in him. Kenton defeated Shawnee 2-1 in the regular season, which turned out to be an extremely physical match. But this match was well played and kept in check by the referee in the middle. Landon Bartlett, the Western Buckeye League player of the year, gave Kenton a 1-0 lead with a sliding boot into the net from 7-yards out. Bartlett got a nice pass from Hayden Hicks for the goal with 20:50 left in the first half. Hicks then scored on a penalty kick. That gave Kenton a 2-0 lead with 6:21 left in the first half. Little did anyone realize at the time that there were plenty of penalty kicks to come to decide the match. Shawnee changed its formation in the second half from four defenders to three and put five players in the midfield. That gave the Indians some offensive push in the final 15 minutes. “We went with the formation (3-5-2) we started the season with and I’m not sure Kenton was looking for another goal (at 2-0 Kenton) and it was pretty effective,” Quatman said. Shawnee’s Carter Jensen took a free kick from 35-yards out and it was headed in by Damien Zeigler. That brought Shawnee within 2-1 with 11:23 to go. Shawnee began rolling through the midfield and was buzzing the 18-yard box. Cameron Tenwalde then chipped a pass inside the box to Ethan Swallow, who pounded it home from 12-yards out. That tied it at 2 with 5:42 to go. In the first round of penalty kicks, Zeigler, Ryan McGuire, Tenwalde and Swallow scored for Shawnee. 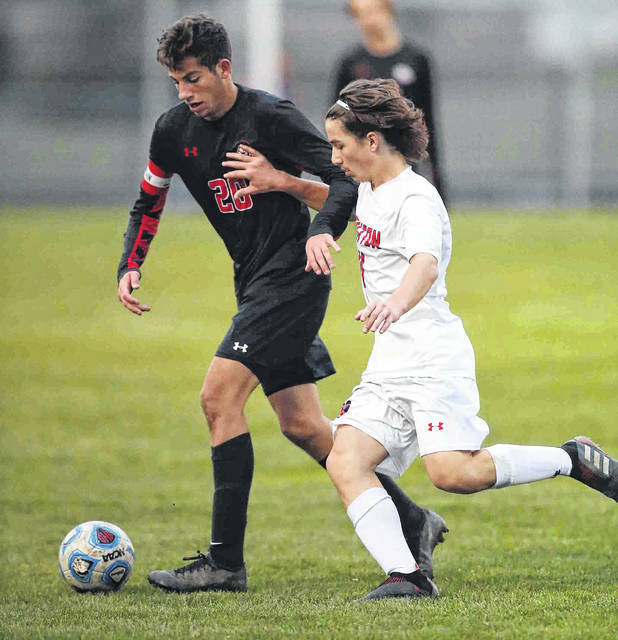 Scoring for Kenton were Landon Bartlett, Hicks, Isaac Mendez and goalkeeper Luke Woodruff, who tied the slate at 4-4 to force a second round of penalty kicks. In the second round, Jensen scored for Shawnee, while Patrick Bartlett scored for Kenton. Both Woodruff and Shawnee goalkeeper Landon Hoehn had a save in the second penalty-kick round. Hoehn finished with 10 saves, including two during penalty kicks. Woodruff had five saves for Kenton. During regulation and two overtime periods, Kenton had 14 shots, while Shawnee had eight. This entry was tagged kenton, shawnee. Bookmark the permalink.